5.25 points at 12 votes (rank 749). After Ryu could win the first Street Fighter tournament, and defeated Sagat, the long-time bearer of the title, a new Street Fight contest is carried out. 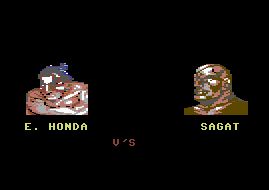 From the known names of the first tournament, next to Ryu only his rivals Ken and Sagat compete anew. However, the new faces on the battlefield are not to be underestimated, next to a Yokozuna of the Sumo Wrestlers compete a Russian wrestler and a green-skinned creature from the Brazilian jungle. Fire breathing Yoga gurus, a Spanish cage fighter, a former American boxing professional... A challenging diversity was prepared. Also a young woman from China competes in this tournament as well as an American officer. They all have different fighting styles and special abilities, but only one of them can gain the title of World Warrior. And for this the chances are low, because even if you have overcome the laborious path successfully, you still have to face the grandmaster M. Bison. If you can defeat your seven opponents, you can compete against the grandmasters Balrog, Vega and Sagat. About the last opponent, M. Bison, not much is known. Word has it, that he is the leader of a criminal organisation named Shadaloo. When Bison is defeated, you have won the game and can enjoy the honouration at the end. The end title is each individually matched to the character that was played; so e.g. Colonel Guile celebrates the final revenge of his comrade's death, before there is a family reunion which could stem from any cheap bashing/Eastern C-movie with a bad plot. Dudikoff, van Damme and Steven Seagal spring to mind, there is hardly anything more cheap and kitchy. 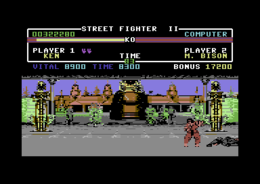 Street Fighter II is an exemplar for beat'em up games and was originally one of the most successful arcade machines. A conversion was done for all common systems at that time. 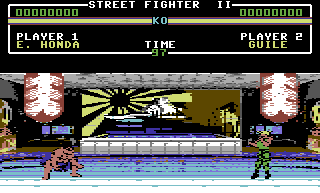 Also on the C64 twelve different opponents have each their own setting for the fights. 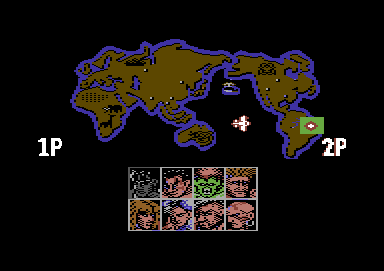 Eight of them can be chosen by the player. 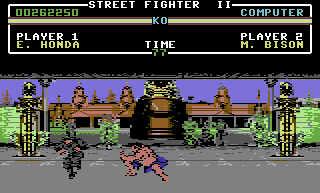 The two-player mode allows a match, the winner needs an adjustable number of KO or time victories. The slight vertical scrolling of the stages and destructible background elements, known from other conversions, was deleted, same as the popular bonus sequences in which you were allowed to smash heaps of stones, burning barrels and a car. Also the successful ending of a game which varies depending on the chosen character, was shortened drastically. The controls suffer mainly because there is only one fire button instead of six available. Between the single stages and the animated map there are significant loading times. This is valid, assuming that the opponent is to the right of the player. Each character has several special attacks. A series of serious hits can lead to a short numbness. The fighters Ryu and Ken were both trained by the grandmaster Gouken. Therefore their style is the same. Balrog: The Afro-American Balrog was once boxing champion in heavy weight. Due to his brutal style and disregard of the boxing rules he was banned for life and the naive boxer became a bully for Shadaloo. Vega: The titled Spanish Vega was once a famous matador, until he combined the characteristics of a torero with the Ninjitsu and merged into a feared cage fighter. This beautiful man is vain and selfish, despises everything that is ugly and sees himself as perfect. To protect his face from injuries he always wears a mask during the fight. He now works for Bison as bodyguard and assassin. Sagat: Once the Thai was the "King of the Street Fighters" and was honoured in his home country as national hero and "God of the Muay Thai". He was defeated by Ryu in a close fight, who also gave him a huge scar on the torso. Therefore, Sagat longs for a revenge for this defeat and became one of Bison's bodyguards. M. Bison: The mysterious Bison is at the top of the worldwide operating crime syndicate Shadaloo, which is located in Thailand. Through his "Psycho Power" and his brutal way to fight, he became „King of the Street Fighters". There are no cheats known. Some of the cracked versions of the game have trainer options. 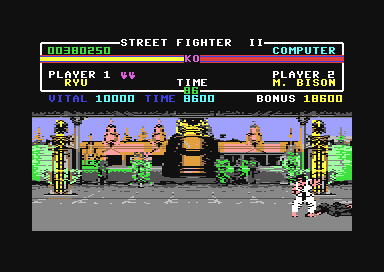 Magic Disk 64 April 1993: "When looking at Street Fighter II every karateka better binds his belt over his eyes!" 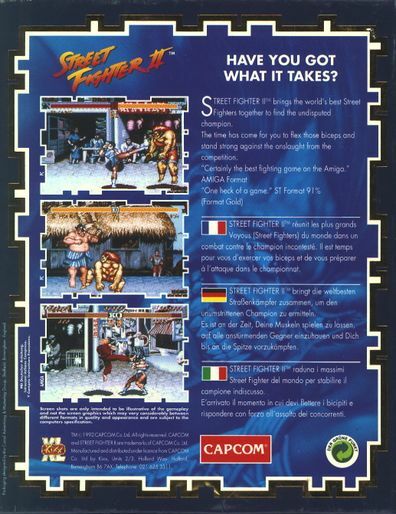 64'er August 1993 (Graphics: 5/10 Sound: 4/10 Vote: 7/10): "...however, Street Fighter II is good concerning the gameplay and will probably enthuse fighting sport fans on the C64. 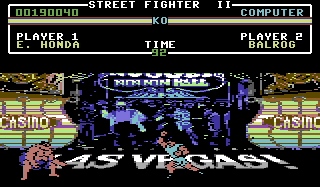 If they had refined the graphics a bit and with some tricks up their sleeves had given the game a bit more of a professional touch, then it would have been a super hit also on the C64. This way is stays a game that will attract nevertheless a lot of fans merely through its tuneful name." Shmendric: "It is a sheer piece of impudence how boldly they tried here to sell graphical rubbish and nonexistent beat'em up feeling with the help of a prominent name. It is almost an agony to look at the monitor. 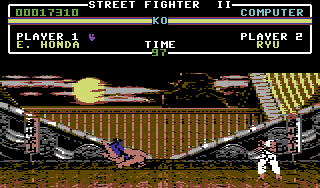 Not only does the C64 have difficulties with a worthy conversion of such a game, but they also did not make any effort at all, maybe in expectation that something named "Street Fighter II" will sell automatically. 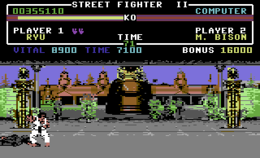 Even if you do not compare it with the original arcade or the also very good Super Nintendo or Mega Drive conversion, but with other bashing games on the C64, Street Fighter II unfortunately comes off horribly." Addition: "Having done the screenshots comfortably in the trainer mode, I have played the game once more honestly, to enter my name in the highscore list. Interestingly, I have not noticed much difference, only during the fight against Dhalsim I felt I had to concentrate for a few seconds, Ryu swept through the game with only the Hurricane Kick. From the estimated 60 fire balls, that were accidentally thrown by the confused pressing of the buttons, only one hit its target - during close combat those things just pass through the opponent without any effect! The most dangerous fighting technique that this game has to offer is clearly the music! I lower my vote to 1, playing this one gave me the rest, I will never ever play this again! P.S. : There are typos in Ryu's end titles... :)"
TheRyk: "Only because a game is more voluminous, it is not necessarily better than its predecessors. The music is mostly harmless, but everything visual is most unsatisfactory. Background gfx are overall so-so, but partially look like cheaply converted from 16bit systems without real effort in terms of post-processing. The sprites do not only look poor but cast serious doubt on the programmers' knowledge of the C64's video chip, it is really hard to understand why the right part of the player sometimes is shifted one or two pixels to the right, even without crossing the x axis overflow. I don't want to talk in greater detail about the flickering, but the terrible animations are worth mentioning. No matter if arms or legs (which are hard to distinguish) leave the body at a move, both looks equally rotten. And once again, it's another far too easy Street Fighter game: Played it through at the very first game, losing just one single fight against Chun Li, not because I was stunned by her beauty, but rather because I was quite shocked how crookedly she sneaks about in this game and had some qualms about beating up miserable old lady with my fists. 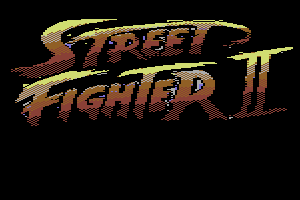 All in all, Street Fighter II provides zero challenge but extreme loading times to show all the terrible graphics. 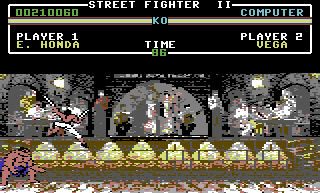 In a series of flopped Street Fighter ports for the C64, this version hits rock bottom, 2 points." Starkiller: "A well-known arcade machine, successful conversion for consoles - and a nasty tip-off of the at that time already heavily waning C64 community. If I had seen Street Fighter II in the middle of the 80s for the first time, I probably also would have been totally unsatisfied. But if you already knew other conversion when the C64 version was released, then seeing this version just causes black horror. Here a 16-bit classic was shamelessly defiled - and with it the poor 8-bit hardware that has to run this sorry effort." 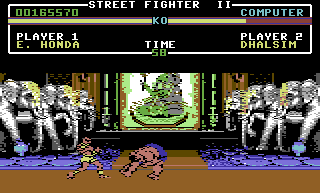 The character "Mike" from the first Street Fighter, resembles optically and concerning the fighting stile the grandmaster "Balrog", although this is hard to recognize in the C64 versions. Both are from the USA and only fight with their fists. Balrog was named in the Japanese original "M. Bison" (Bison in return had the name Vega and Vega again was named Balrog). Assuming that Mike and Balrog are the same person, at least in Japan, the full name would be "Mike Bison". This is an explicit homage to the at that time very successful boxer and heavy weight world champion Mike Tyson. 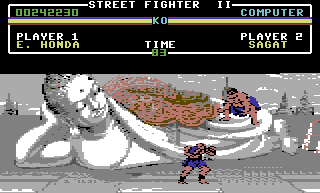 The sprites of Mike, or Balrog, also have a noticeable similarity with the sportsman. Looking at it that way is Balrog next to Ruy, Ken and Sagat the fourth fighter that is already known from the forerunner version. 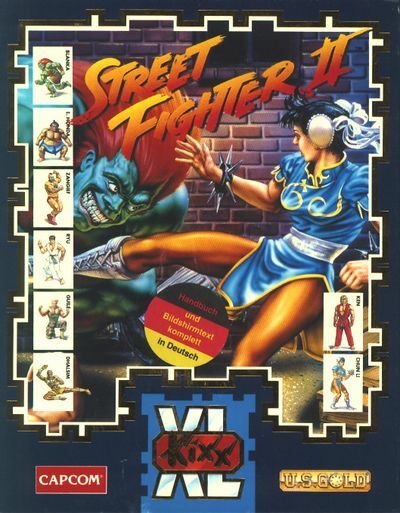 Chun Li is seen as the first woman that can be chosen as a character in a beat'em up. 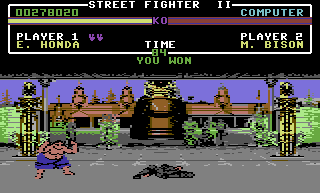 This is is only half true, in Yie Ar Kung-Fu II the fan throwing Lan-Fang was selectable in the two-player mode. Since the success of Street Fighter II, female fighters have a regular appearance in beat'em ups. Due to a misunderstanding, the name Shen Long (Cant. for rising dragon) was often given outside of Japan instead of Gouken as the master of Ken and Ruy, but originally the special technique "Dragon Punch" was meant (Jap. Shouryuken). The Cantonese word was left unchanged in the translation from Japanese and the interpreted as a name abroad. The magazine EGM (Electronic Gaming Monthly) took the liberty of a legendary April Fool's joke. In the cheats section they reported, that the game needs to be played with Ryu at the highest difficulty grade without losing energy until reaching M. Bison, to then endure ten rounds without hitting him or getting hit yourself. Only then would the secret character Shen Long (actually Gouken was meant) be unlocked. For this a fake screenshot of the man was shown. The ten fighting rounds could not take place because after the fifth round the opponent had won when there was a draw. As the high point of it all there was another article in the lower half of the page that reported in detail about the April Fool's joke from last year. Even years later the rumour about the most secret character of video game history could not be written off. 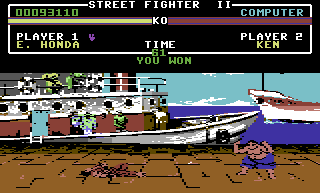 And almost 20 years later Gouken actually had his debut: in Street Fighter IV (no C64 conversion). There were persistent rumours about a secret key code with which you could also choose the grand masters to play since the first console conversation. This cheat is definitely a rumour, the grand masters do not have a programme code to be steered by the player in any of the conversions. Only with the Turbo version (no C64 conversion) was this possible. Previously, there was a special edition only released in Japan. 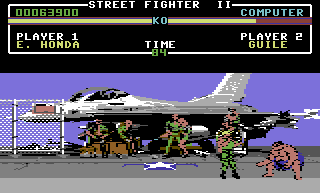 But there was often a key combination to be able to choose the same character for both players in the two-player mode - however, not in the C64 version. Delusive advertisement with screenshots of other systems on the cover of the C64 version was unfortunately common practice, it was vindicated by the lower production costs. Woe to the C64 gamer who lets himself get blinded by the images on the reverse side, the screens have nothing to do with the C64 game, but are marked as "Amiga" and "PC" in very small print. This page was last modified on 13 November 2017, at 21:14. This page has been accessed 5,637 times.